Drumroll please… I have now completed my third book of the year. Third. You may recall my goal was to finish two. You may also recall that didn’t really seem like a legitimate goal. Well, for me it was, and I have now exceeded it! 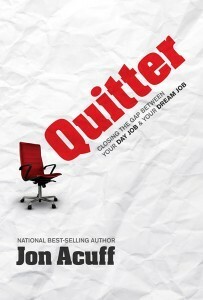 The book I finished is Jon Acuff’s Quitter. I learned a lot from this book. At first glance it may seem like a book that is going to tell you to “quit your day job!” and “live life to the fullest!” But this book is different. Yes, the point of the book is to follow your dream—but this is a different approach to how. Keep your day job. Let it fund and support your dream rather than keep you from it. Jon is hilarious and a great writer. If you’ve ever read his blog Stuff Christians Like, you know that. He’s quickly becoming someone I look up to. In fact, Jesus Juke is one of my new favorite terms. More than anything, it is encouraging. Whether you have a dream, would like to have a dream, or are currently living your dream, this is a great book to have by your side. It’s very practical and could almost serve as a manual to go back and reference as you move through the stages of pursuing a dream job. If you are interested in ordering it, click here! I highly recommend it.